The Climate of Andaman & Nicobar Islands is described as Tropical climate. Andaman and Nicobar Islands has a humid Weather and has no winter season. Rain season lasts for 180 days in a year. The southwest monsoon touches the Indian soil first in the Andamans and then proceeds towards the Indian mainland. Seasons: Summer - January to April, Monsoon - May to December. Relative Humidity: 70% - 90%. Andaman & Nicobar Islands is always warm, with pleasant sea-breeze . The rainy season happens twice a year under the influence of Southwest monsoon in mid-May to September, and Northeast monsoon in November To January. There is medium to heavy rain during the monsoon, in the months from May to mid September and November to mid December. There is no extreme climate except rains and tropical storms in late summer. The weather is calm only from January to April and to some extend in October. 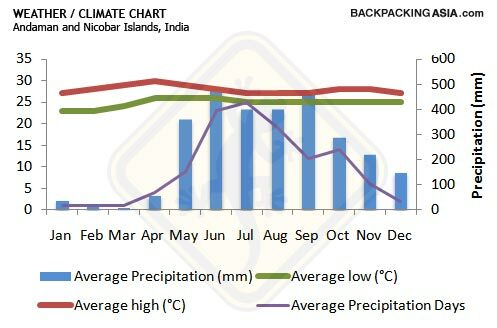 It is quite hot in the months of March to May in the Andamans. The best time to visit the Andaman & Nicobar Islands is between mid November and April. For More Details Watch The Below Link.